Aileen Ward (Albert Schweitzer Professor of the Humanities, Emeritus, New York University) is author of John Keats: The Making of a Poet and of articles and reviews on British romantic writers, and editor of selected works by Blake, Keats, and De Quincey. She is currently at work on a biography of Blake. Morton D. Paley’s (mpaley@berkeley.edu) most recent book is The Traveller in the Evening: The Last Works of William Blake. He is currently working on a study of Samuel Taylor Coleridge and the fine arts. Michael Fischer (mfischer@trinity.edu) is the author of Stanley Cavell and Literary Skepticism (1989) and numerous articles on romanticism and literary theory. He is professor of English and Vice President for Academic Affairs and Dean of the Faculty at Trinity University. Magnus Ankarsjö (magnus.ankarsjo@ntu.ac.uk) is a lecturer at the University of Northampton and a visiting fellow at Nottingham Trent University. He is the author of William Blake and Gender (Jefferson, NC: McFarland, 2005). Justin Van Kleeck (jsv6s@virginia.edu) recently completed and defended his dissertation, on the editorial history of the Four Zoas manuscript, at the University of Virginia. 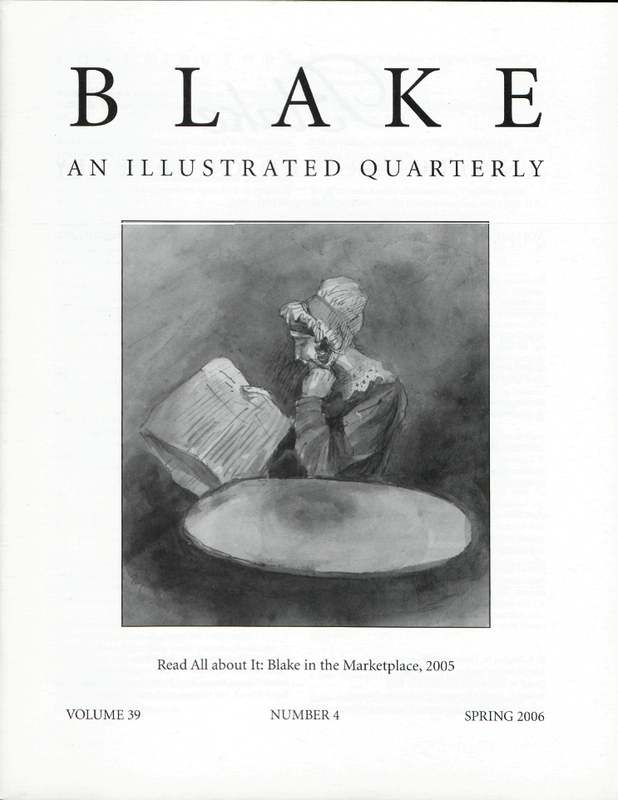 The obsession lives on, however: he is currently working on an electronic edition of the manuscript for the Blake Archive. Cover: George Cumberland, Portrait of Catherine Blake(? ), c. 1783-85(?). Essick collection. See pp. 164-65.